Nearly five years after September 11, 2001 United States leaders continue their homeland security campaign. Following the September 11th attacks, President Bush proclaimed to a mourning audience at the National Cathedral that terrorists ‘attacked America because we are freedom’s home and defender’ (Bush, September 14, 2001). After acknowledging the attack that ‘shattered steel’, the President bolstered the American public by promising that the terrorists ‘cannot dent the steel of American resolve. America was targeted for attack because we’re the brightest beacon for freedom and opportunity in the world. And no one will keep that light from shining’ (Bush, September 11, 2001). In the days and years ahead the President promised America would build ‘a House of Freedom’, in a world where ‘freedom and fear areat war’ and to fight freedom’s fight, in the President’s worlds, was ‘the great divide in our time. Between civilization and barbarism’ (Bush, September 13, 2001). In its broadest sense, my research argues that it is apparent that since September 11, 2001 the Bush administration’s rhetoric has shifted numerous times, from an initial ‘rhetoric of ideological pronouncement’ featuring the common archetypal metaphors of ‘savagery’ and ‘civilization’ (Cohen, 2004a, 2005), to a ‘rhetoric of indoctrination’ urging the U.S. public to embrace the Bush administration’s shift in National Security Strategy making the grounds for preventive and preemptive war indistinguishable (Cohen, 2004b); to an explicit strategy of global ‘ideological argumentation’ that I will describe in this essay. Throughout this rhetorical sequence, the mechanism of casuistic stretching has enabled the President of the United States to negotiate and transcend certain contradictions inherent in the war on terror. By expanding the circumference of arguments promoting the so-called ‘war on terror’, however, most recently the administration has found itself on unstable argumentative grounds in its global efforts. Specifically, the continued spector of al-Queda attacks in Bali, Madrid, London, and an Egyptian resort area, among others in the last year clearly shows how al-Queda targets are unambiguously wider than U.S. democratic values or prized symbolic targets. The changing global environment, or scene in the war on terror, invites argumentation critics to consider the ways there is a fundamental rhetorical disorientation tothe Bush administration’s latest anti-terror efforts, since new efforts in the war on terror can advance itself only by means of the leverage received from its September 11th rhetorical antecedents. Informed by this insight into the nature of the nation’s pursuit of its homeland security objectives, my essay will attempt to orient itself around some of the ways in which the Bush administration’s recent ideological argumentation was designed to better align the administration’s foreign policy rhetoric with that of its war objectives. This is not to suggest that the origination of the war on terror was not inherently ideological, but rather I maintain that the effort moved from ideological pronouncements of policy to ideological arguments backing foreign policies that attempted to mystify the stakes of the administration’s actions. I conclude however that this argumentation strategy is ill-equipped to be persuasive to the international audience as they are adopted and recirculated by members of this international community. Thus, the paper concludes by considering the Bush administration’s latest rhetorical strategy from a global perspective. The troops here and across the world are fighting a global war on terror. The war reached our shores on September the 11th, 2001. The terrorists who attacked us – and the terrorists we face – murder in the name of a totalitarian ideology that hates freedom, rejects tolerance, and despises all dissent. Their aim is to remake the Middle East in their own grim image of tyranny and oppression – by toppling governments, by driving us out of the region, and by exporting terror. Clearly if Osama says it’s a war, it’s a war. For the first time the President took the overt position that a network of terrorists launched World War III. The remarks beg the question – how does the United States lead a global war while continuing to prepare the nation to stomach a fight against this enemy that lives among global populations and moves with global transportation flows that expose the vulnerabilities in the United States’ best homeland security plans. Although controversy erupted over both Rove’s comments and the President’s victory plan, the London bombings provided the political cover and opportunity for the Bush’ administration to reinforce its position on global terrorism and to seek higher argumentative ground. Unlike New Yorkers, Londoners retained the fresh memory of past attacks, most recently the Irish Republican Army’s mainland movement using bombs as a terror tactic, and the Germans’ bombing during World War II. Indeed, those unfamiliar with British history should remember that during the1980s the Irish Republican Army targeted London’s financial district, the Harrods department store, the prime minister’s offices, and was responsible for action against a Conservative Party conference in 1984 that was attended by then-Prime Minister Margaret Thatcher who managed to escape the bombing that killed 5 other people. Given that the attacks coincided with the opening of the G-8 nation summit, before Blair returned to London he issued the statement alongside international leaders such as George W. Bush and French President Jacques Chirac that ‘We will not allow violence to change our societies or our values’ (cited in Daniszewski, July 8, 2005, p. A1). It’s reasonably clear that there have been a series of terrorist attacks in London. There are obviously casualties, both people that have died and people seriously injured and our thoughts and prayers, of course, are with victims and their families. It’s my intention to leave the G8 within the next couple of hours and go down to London and get a report face-to-face with the police and emergency services and the ministers that have been dealing with this, and then to return later this evening. It is the will of all the leaders of the G8, however, that the meeting should continue in my absence, that we should continue to discuss the issues that we were going to discuss and reach the conclusions that we were going to reach. Each of the countries round that table have some experience of the effects of terrorism and all the leaders, as they will indicate later, share our complete resolution to defeat this terrorism. It’s particularly barbaric that this has happened on a day when people are meeting to try to help the problems of poverty in Africa and the long-term problems of climate change and the environment. Just as it is reasonably clear that this is a terrorist attack or a series of terrorist attacks, it is also reasonably clear that it is designed and aimed to coincide with the opening of the G8. When Tony Blair returned to London he expressed ‘profound condolences to the families of the victims and for those who are casualties of this terrorist act … There will of course now be the most intense police and security service action to make sure that we bring those responsible to justice … We know that these people act in the name of Islam, but we also know that the vast majority of Muslims here and abroad are decent and law-abiding people who abhor this act of terrorism every bit as much as we do’ (qtd. in Daniszewski, July 8, 2005, p. A1). ‘The attackers’, he said, ‘are trying to use the slaughter of innocent people to cow us, to frighten us out of doing the things that we want to do, or to try to stop us going about our business as normal, as we are entitled to do, and they should not and will not succeed’ (qtd. in Daniszewski, July 8, 2005, p. A1). Scholars of political communication and rhetoric have considered the ways that rhetoric may be used to oppress free and critical discussion, or to promote unreflexive or uncritical ways of thinking. To the extent that rhetoric reflects, deflects, and selects reality, reality is far from given but it is something experienced by rhetorical formation. The shift in the Bush administration’s war on terror rhetoric after the London attacks raises appreciable interest to argumentation scholars concerned with the way that ideological argumentation may foster of mystification of reality, the cost of which offloads onto publics as the death toll rises and is covered over. Many scholars noted that after September 11th public space for criticism of administration policy became constricted for a variety a reasons while the nation mourned and the nation’s leaders sought to rally the public around the flag during a time of crisis (Benhabib, 2002; Cloud, 2003). As Suzuki (2001) notes, ideological pronouncements promote ‘a logic in search of absolutes and [is] likely to proliferate in periods of fascist ideology, especially in wartime’ (p. 255). In contrast, ideological argument promotes itself as a kind of rationality for explaining or establishing certain power relations. Michael Calvin McGee and Martha A. Martin (1983) describe ideological argumentation as a process that ‘characteristically avoids difficult entanglement in the specifics of its subject matter, seeking rather to settle problems by establishing or amplifying the ‘common’ morality of the community’ (p. 60). According to Michael Weiler (1993), ideology may masquerade as argument when it ‘presents itself in the form of rational, philosophical argument. It presents theses and gives reasons. It supports these reasons not with divine revelation or royal pronouncement but with scientific, empirical evidence’ (p. 25). The Bush rhetoric here in contrast to that of the Blair administration is indicative of important amplified rhetorical differences in the global war on terror where the stakes of the controversy are mystified by appeals to common morality. This is not to suggest that the underlying ideology in the war on terror has shifted. Rather its articulation has moved from pronouncements to a type of presentation of ideological claims as a form of reasoning. By retooling its rhetorical strategy, Bush administration officials argued that the attacks were symptomatic of a battle in the war on terror, but also began to emphasize the ongoing, ideological nature of the battle perverting Islam to account for the shifting nature of the global battlefield. I find Bush’s rhetoric here to be indicative of his administration’s shift to an overt ideological argumentative struggle that mystifies the stakes of war and legitimate legal mechanisms to pursue criminals; this struggle continues to pitch ideology at the center of its justifications for continued efforts in the war on terror. You might recall that since September 11th Bush had emphasized the ongoing nature of the war. But, his advisors were more cautionary. In July 2005, however, DefenseSecretary Donald Rumsfeld began to characterize ‘a global struggle against violent extremism’, replacing his earlier emphasis and application of ‘the global war on terror’. Gen. Richard B. Myers, chairman of the Joint Chiefs of Staff, spoke of the redefinition publicly before the National Press Club, stating that he had ‘objected to the use of the term ‘war on terrorism’ before, because if you call it a war, then you think of people in uniform as being the solution’. He said the threat instead should be defined as violent extremists, with the recognition that ‘terror is the method they use’ (qtd. in Schmitt & Shanker, July 26, 2005, p. 7). And argued, future efforts require ‘all instruments of our national power, all instruments of the international communities national power’ (qtd. in Schmitt & Shanker, July 26, 2005, p. 7). The solution is ‘more diplomatic, more economic, more political than it is military’ (qtd. in Schmitt & Shanker, July 26, 2005, p. 7). Steven J. Hadley, the national security adviser, repeated the refrain, arguing ‘It is more than just a military war on terror. It’s broader than that. It’s a global struggle against extremism. We need to dispute both the gloomy vision and offer a positive alternative’ (qtd. in Schmitt & Shanker, July 26, 2005, p. 7). The difficulty with this rhetorical choice, however, is that it was widely recognized for its partisanship, at odds more or less with the Bush administration’s previous rhetorical strategy. While at the same time our nation’s interest in terrorism clearly remains separate and unique, the shift in rhetorical strategy to the struggle against global extremism functions to ‘join and separate’ (Burke, 1961, pp. 544-545); to articulate a global vision while at the same time maintaining the United States’ manifest destiny. The divisions among people, among nations, require rhetoric to establish unity through alliances, or commonality in national interests. At the same time, the choice was belied by the administration’s rhetorical motivations. During the 2004 election campaign there were many moments when candidate George Bush tried to refocus the nation away from the war on terror. For example, Bush’s August 6th, 2004 remarks to the UNITY: Journalists of Color convention in Washington included his opinion: ‘We actually misnamed the war on terror, it ought to be the struggle against ideological extremists who do not believe in free societies who happen to use terror as a weapon to try to shake the conscience of the free world. [laughter] No, that’s what they do. They use terror to – and they use it effectively, because we’ve got good hearts. We’re people of conscience, they aren’t. They will cut off a person’s head like that, and not even care about it. That’s why I tell you, you can’t talk sense to them’. The New York Sun reported the laughter at Bush’s remark but that ‘the President made it clear he was not joking’. In a September 6, 2004, column, United Press International homeland and national security editor Shaun Waterman wrote that Bush repeated the remark, ‘stripped of hyperbole, in all seriousness’. Yet, in July editorials from global newspapers lampooned the Bush administration’s rebranding efforts. For example, a Sacramento Bee editorial opined, ‘If not war, what? By any name, the reality is grim’. The rebranding exercise was clear and exposed, from the London’s The Daily Telegraph to Al Jazeera. In London, no one claimed that everything changed after 7/7. Tony Blair did not make pronouncements declaring war on the dead bombers. Clearly there were terrible mistakes made in the investigation when British intelligence services went hunting for conspirators in the attack, and fatally shot Electrician Jean Charles de Menezes on July 22nd, 2005. Yet, the police took responsibility and apologized for the fatal error. The Metropolitan Police Chief, Ian Blair, in fact articulated many citizens desire to continue on with their July 6th police force, and that the public – not bureaucrats or a special department of homeland security should decide what they want. What could and will Britain and its police be like in seven years time? … 7th July asked – and continues to ask – questions of those assertions. So, when I ask ‘what kind of police service do we want?’, I have an assumption: we want a 6th July police service, not a 7th July police service … However, we can’t have that to which 6th July aspired without understanding 7th July … That deeply regrettable death makes even louder the question, ‘what kind of police service do we want?’ And here I come to the second question, which is ‘who is to decide?’ and I return to my story about running back that far. Despite my whole professional lifetime in policing, I believe it should be you, not me, who decides what kind of police we want …. In contrast to the United States’ post-September 11th experience, the Bush administration utilized the terror attack to justify a range of homeland security policies and shift in National Security Strategy (Cohen, 2004a, 2004b) and in contrast with presidential attempts to handle terrorist episodes (Winkler, 2005). Bush’s most recent rhetoric, rhetoric after July 7th, worked to transcend the fundamental dilemmas of his war on terror in light of global terrorist episodes: how to reaffirm the hegemonic role of the United States while maintaining the global nature of the war on terror; and how to reconcile the escalating global loss of life due to terror attacks abroad while maintaining the United States special connection and recognition of a ‘post-9/11’ threat to U.S. soil. Bin Laden has stated: ‘The whole world is watching this war and the two adversaries. It’s either victory and glory, or misery and humiliation’. The terrorists regard Iraq as the central front in their war against humanity. And we must recognize Iraq as the central front in our war on terror. We’re facing a radical ideology with inalterable objectives: to enslave whole nations and intimidate the world. No act of ours invited the rage of the killers – and no concession, bribe, or act of appeasement would change or limit their plans for murder. On the contrary: They target nations whose behavior they believe they can change through violence. Against such an enemy, there is only one effective response: We will never back down, never give in, and never accept anything less than complete victory. ‘It is the understanding of the United Kingdom that the term ‘armed conflict’ of itself and in its context denotes a situation of a kind which is not constituted by the commission of ordinary crimes including acts of terrorism whether concerted or in isolation’ (Sassoli, 2004). American presidential rhetoric for decades also failed to equate terrorism with armed conflict, and terrorists as having state status. The distinction, as O’Connell notes is legally significant. The counter-attack for September 11th occurred on October 7th when the U.S. dropped its first bombs on targets in Afghanistan, creating combatants in Afghanistan not worldwide. However, in the Bush administration’s most recent ideological argumentation the administration is arguing that the global war on terror is a real war. That is, they equate the sporadic attacks by Al Queda on U.S. targets as an armed conflict and ideological conflict as grounds for armed conflict. I follow a number of scholars, particularly legal scholars such as O’Connell (2006) who have made this case more eloquently on grounds of international law, that ‘it is time to drop the war on terror rhetoric, and it is time to get the country into compliance with international and U.S. law’. Benhabib, S. (2002). Unholy politics. Reclaiming democratic virtues after september 11. In: C. Calhoun, P. Price & A. Timmer (Eds. ), Understanding september 11 (Vol. I). New York: Social Science Research Council. Burke, K. (1961). The rhetoric of religion: Studies in logology. Boston: Beacon Press. Cloud, D. (2003). Therapy, silence and war: Consolation and the end of deliberation in the ‘affected’ public. POROI, 2(1), http://inpress.lib.uiowa.edu/poroi/papers/cloud030816.html. Cohen, E. L. (2004a). Crafting homeland security: The rhetoric of responsibility, security, and democratic practice. In: T. Suzuki (Ed. ), Proceedings of the 2nd Tokyo international conference on argumentation. Tokyo, Japan: Japanese Debate Association. Cohen, E. L. (2004b). National security strategy and the ideology of preventive war. In: L. Artz & Y. R. Lamalipour (Eds. ), Bring-em on! Media and politics in the U.S. War on iraq. Chicago: Roman & Littlefield. Cohen, E. L. (2005). Congressiona; debate over the 2001 patriot act: Arguments for consensus, error-correction, and expediency. In: C. A. Willard (Ed. ), Critical problems in argumentation (pp. 779-786). Washington, D.C.: National Communication Association. Daniszewski, J. (July 8, 2005). Terrorists strike in London; at least 38 killed, 700 wounded in subway, bus blasts. Los Angeles Times, p. A1. Healy, P. D. (June 23, 2005). Rove criticizes liberals on 9/11. The New York Times, p. http://www.nytimes.com/2005/2006/2023/politics/2023rove.html?ei=5090en=be2050f2004c2006a2001d0259&ex=1277179200partner=rssuserland&emc=rss&pagewanted=print. If not war, what? By any name, the reality is grim. (July 29, 2005). Sacramento Bee, p. B8. McGee, M. C. & M.A. Martin (1983). Public knowledge and ideological argumentation. Communication Monographs, 40, 47-65. O’Connell, M. E. (2005). Enhancing the status of non-state actors through a global war on terrorism. Columbia Journal of Transnational Law, 43, 435. Russell, A. (July 28, 2005). War on terror gets new name: S.A.V.E. ‘struggle against violent extremism’. The Gazette (Montreal), p. A16. Sassoli, M. (2004). Use and abuse of the laws of war in the ‘war on terrorism’. Law and Inequality, 22, 195, citing Reservation by the United Kingdom to Art. 191, par. 194 & Art. 196, par. 193 of Protocol I.
Schmitt, E. & T. Shanker (July 26, 2005). New name for ‘war on terror’ reflects wider U.S. Campaign. The New York Times, p. 7. Suzuki, T. (2001). The cardinal principles of the national entity of Japan: A rhetoric of ideological pronouncement. Argumentation, 15, 251-266. Weiler, M. (1993). Ideology, rhetoric and argument. 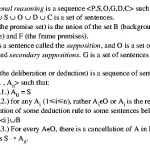 Informal Logic, 15, 15-28. Winkler, C. (2005). In the name of terror: Presidents on political violence in the post-world war II era. Albany: SUNY Press.